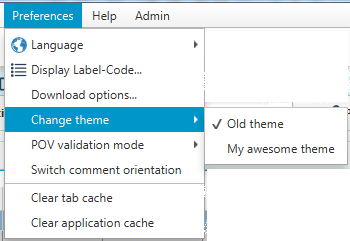 Change your application theme dynamically. I recently spent quite some time on a trivial (apparently not) issue. I wanted to deliver custom themes for my application, and allow users to radically change the look with a click in a Menu. The difficulty went with the fact that I wanted to allow people to modify my application JAR, in order for them to ship their own theme. Here is how I’ve done it. First of all, we need to agree on a theme. In my application, it’s a sub-package in the resources providing a stylesheet, and some icons. I provide a mandatory theme called defaultIcons, and each client can add its own. Also note that theme can be incomplete. If a user wants to change the copy and paste icon, but let the rest untouched, it’s possible. I wanted it flexible. Once we understand that, I needed to dynamically find and load my themes. Well that wasn’t easy because you have a FileSystem with your IDE when developing, and you have a JAR when you install your application. So two different things and I must admit I don’t think my solution is the best.. But at least it’s working! * "i18n.properties" file which contain the Labels for the files. //I get the "theme package". //If I'm installed, I have a JAR. //I need to manually specify my path to the theme package. //If I'm working on my IDE, it's smooth. //I create a toggleGroup to group my themes. //I used FileNameUtils of org.apache.commons.io because I was too lazy to implement myself..
//The "theme" package is returned itself, but we are interested only in the sub-packages. //I store the current used theme here, so I just check the Menu if it's the one used. So basically, I find the sub-packages by inspecting my JAR (or fileSystem). I used FilenameUtils or org.apache.commons.io in order to extract the package name from the path (com/myCompagny/Myapplication/theme/NewTheme for example). But I think you can easily do that yourself and get rid of the dependency. * Given a File denoting a Package, we try to isolate the "i18n.properties"
* in order to get the Label to display in the menu for different languages. //Here I just return the current Locale, and used the method "toLanguageTag" on it. * found, we fallback to the defaultIcons package. //It will be for example, "theme/myNewTheme/copy.png"
//We fallback on the default icon. For the Image cache, explanation in a previous article here. If you have any improvements, feel free to comment. Previous Previous post: About caching and optimizing your application. Next Next post: Drag an undecorated Stage with the mouse.